This is our second and last move! Our first move was when our boys were 3 and 1. This time we’ve added one more to the family; kids aging 5, 3 and 1. My worries probably were worse then my kids as they adapt quickly at this age. It was a matter of working through the kids anxieties surrounding the move that made them transition well. Our biggest concern was that our 5 year old would have to change schools and meet new friends. When I think back to my kindergarten years I don’t even remember who I hung out with. The majority of us in kindergarten split off in our own directions to build new and wonderful relationships elsewhere. We told our kids a few months in advance that we would be moving and tried to prepare them as best as we could for the change. As we progressed through the months before the move one of the biggest things that stood out that we didn’t think to address was: WE WOULD ALL BE TOGETHER and ALL OF OUR THINGS WERE COMING WITH US. There was some emotional distress in the brains of our little ones over the unknowns. They had no problem moving but they did have a hard time leaving their stuff behind. Surprisingly it wasn’t really a materialistic concern, more of a comfort concern. For example it was the kids beds and furniture that needed to come with us. I guess the safe space of their rooms was important to recreate at the new house. The other main thing to address was that we were all going. No one would be left behind and no matter where we were so long as we were all together it would be a fun adventure. Once the 2 biggest calming factors were addressed, the family and our items, the stress dissipated and the excitement could begin. One of the most dreaded parts of moving is packing up and storing things away. I would recommend decluttering months ahead of time and storing the things that you don’t need on a regular basis. 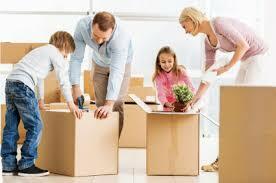 For the kids sake keep their rooms in tact until 2 weeks before the move. Get a bunch of boxes ahead of time and pack one box at a time so that you’re not packing up the whole house all at once. Things you don’t need are usually: garage items, decorative items, seasonal clothes, basement items. Pack these up first. Pick toys that the kids play with the most and keep them out until the very end. Pack up the other toys and decrease the clutter. The week before the move talk to the kids again about where all of their items are going to be and make it fun for them to open at the new house. They can decorate their own boxes so they know which ones are theirs! Have someone the kids know well watch them and have fun with them. If possible have the kids be a part of the beginning of the move, seeing the moving truck, putting something in the truck and then letting them play the rest of the day elsewhere. Let the kids see the change happening and mentally process it without it being shocking. Set up the kids rooms right away if possible so that when they get there they’re excited for their new space. If the kids are into something cool and want a new element added to the new room pick something to decorate with and have it ready when the kids enter their room. We all know that young kids get excited about new things. (It doesn’t have to be brand new, but new to them). Our son was really excited to have his own room after sharing with his brother. We put in a used desk which was really exciting for him to have his own quiet space to work on his own creations without anyone interrupting him or touching his things. We are now close to 1 month into our move and we’ve had a really good adjustment. There have been a few times where the kids have said they miss the old house and neighbourhood. We reassure the kids that we will have play dates with our friends from the old house and attempt to stay connected. One of the other things that I’ve found useful is getting into a routine quickly. My 5 year old is at school and he’s meeting new friends right away. My 3 and 1 year old are home with me and I make an effort to get out to play groups or new places so that we are excited to be in our new community and our new home. This entry was posted in Uncategorized on April 6, 2016 by riannaposkin.